Syria seems to be the last of the nations thrown into upheaval by the "Arab Spring" that is still "in play." The government of Bashar al-Assad, Syria's increasingly isolated strongman, has not yet fallen, but the protests still rage and most of the Western world has turned against him. As the withering attacks and reprisals by Syria's security forces against the opposition continue, the UN, NATO, and the West find it more difficult to explain why they intervened in Libya, yet are turning a blind eye to the atrocities occurring in Syria. Iran has leapt to Syria's defense, warning the West not to involve itself in Syria's internal affairs. Russia and China have made it known that they will protect Syria against damaging resolutions proposed by the UN's Security Council. 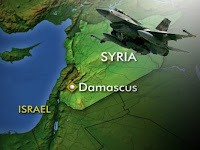 Some military and intelligence analysts are worried that Assad may intentionally launch an attack against Israel to force other Arab and Muslim nations to rally around Syria - and make the West forget their grievances with his regime. Of course, anyone who is familiar with Bible prophecy knows that would be a mistake of monumental proportions. Isaiah's prophecy concerning Damascus, found in chapter 17 of his book, is yet unfulfilled. So we know it's going to happen. We just don't know when. That's why, when these kinds of circumstances arise and these kinds of threats are evident, those of us who believe what the Bible says sit up and take notice. This week I'm going to thoroughly review what the Bible predicts about Syria's future. "And behold at eveningtide trouble; and before the morning he is not." Once that happens, I'd say the world is on the fast track to Armageddon. But what about all the other Arab nations and the Persian-Russian confederacy? This week, I'm also going to share my perspective on how all of that may unfold, including some thoughts on the events described in Psalm 83. But don't worry, I'm not going to leave you hanging. I'm also going to discuss with you the believers' "unfailing hope." As I see it, there are four elements to our hope for the future, but the imminent prospect of Christ's return is a cornerstone of that hope. If you're not prepared for the sudden return of Jesus Christ for His bride or if you know someone who isn't, please tune in this week. I'm going to share with you precisely how you can get ready.